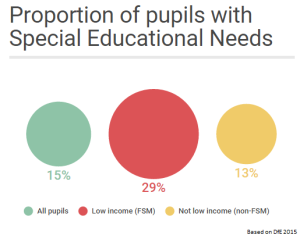 One of the biggest disappointments in yesterday’s White Paper was the continued marginalisation of special educational needs and disability (SEND) within the Government’s vision for “Educational Excellence Everywhere”. Here at LKMco we firmly believe that schools and youth organisations should do more to meet the needs of children and young people with SEND. After all, these students make up 13.7% of all children in schools, and 29% of the pupils eligible for FSM in schools. Yet even though the White Paper contains a sizeable chapter on improving outcomes for disadvantaged children, not once does it make the link between the barriers faced by disadvantaged children and the heightened prevalence of SEND among this group. What detail there is on SEND provision is positive and optimistic, but it is already dated and lacks depth. In fact, I didn’t spot anything different to that covered in the 2014 reforms, other than a vague sounding intention to “invest in supporting professionals in schools and colleges to achieve better outcomes”; and even this should be viewed in light of a failure to mention SEND in the chapter on teacher training. The DfE rightly highlight a laudable ambition to give parents a stronger role, but are too hasty in claiming progress. 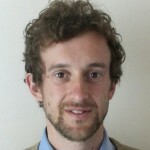 Whilst they point out that, from May 2016, both OFSTED and the Care Quality Commission will be reviewing this area, there are several mechanisms that need fixing before parents in all parts of England can really have a meaningful say in provision, and before quality provision both in and out of schools becomes the norm. A more meaningful step would be to support Local Authorities in adapting to their changed role. At the moment, they are expected to arrange high needs provision themselves, be responsible for the quality of all SEND provision in their area, and provide information about both school and out-of-school SEND services through the local offer. As we pointed out in our report Joining the Dots the quality of “Local Offers” varies widely and as Jarlath O’Brien points out in the TES, local authorities’ ability to maintain essential support in the future is now in the balance. Furthermore, in an era of universal academisation and tight local government budgets, it is far from clear that LAs are best placed to monitor the quality of SEND provision in schools. Instead they should concentrate on helping parents navigate the Health, Social Care and Education sectors, and providing a high quality support services for SEND – something that parents value and which Jarlath’s important article shows is crucial for schools. When it comes to monitoring standards in schools, this is best done by Ofsted and Regional School Commissioners (RSCs) – something that will be easier to do in a system where all schools come under RSCs remit. The DfE should therefore concentrate on bolstering their capacity to provide oversight. Schools need to place SEND at the top of their agenda and this White Paper fails to deliver that message. It highlights the new requirement for schools to engage with parents of children with SEND, but does not back this up with enough support for schools to engage in a meaningful way. Parental engagement needs to be recognised as a challenging, and important skill, and all SENCOs need training in this role. In turn, teachers should receive more, and better SEND training as part of their ITT and as CPD, that focuses on SEND pedagogy so that SENCOs can concentrate on the coordination, communication and management elements of their roles. This White Paper represents a missed opportunity to set the tone for the sector. School leaders should both be expected, and incentivised to place high quality SEND provision at the top of their agenda. If we want Educational Excellence Everywhere, we have to make it clear that improving outcomes for children with SEND needs to be a fundamental priority for every school and education or youth organisation. Only then will children and young people with SEND have a fair chance of making a fulfilling transition to adulthood.